The high precision optical tachometer is a digital, battery powered, contact-free or mechanical measuring instrument that can be used via integrated laser or mechanical attachments. The digital, optical laser tachometer is suitable for determination of rotation speed of machines, parts and equipment (motors and belt drive). The measurement of the high precision optical tachometer is contact-free with the help of a reflex brand that is fixed on the moving part and reflects the laser. Moreover you have the opportunity to measure rotation speed and linear measurement of moving parts (e.g. 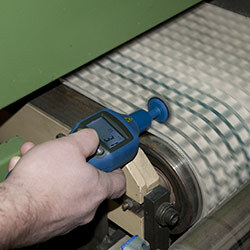 at conveyor belts) with the high precision optical tachometer via mechanical attachments. The mechanical measurement of rotation speed appears with a contact probe as measuring attachment that will be fixed directly on the axis point of the rotary motion. A surveying wheel will be fixed on the adapter of the high precision optical tachometer for speed and linear measurement. 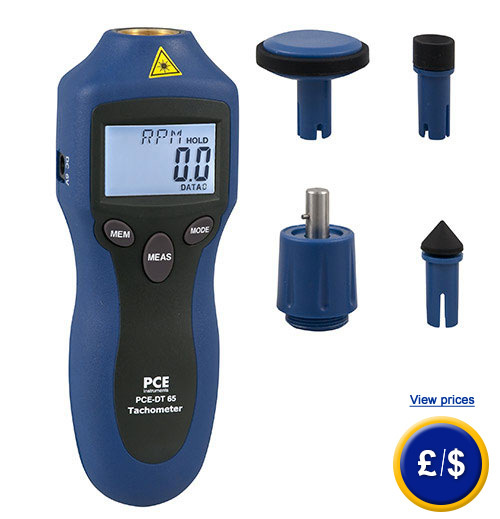 If you have any questions about this High Precision Optical Tachometer PCE DT-65, seet the technical specification below or contact us: UK customers +44(0) 23 809 870 30 / US customers +1-410-387-7703. Our technicians and engineers will gladly advise you on all data loggers and all products in the field of measuring instruments, regulation and control and scales. 0.1 U/min in the range of 2.0 … 9999.9 r.p.m. 1 U/min in the range of 10,000 … 99,999 r.p.m. 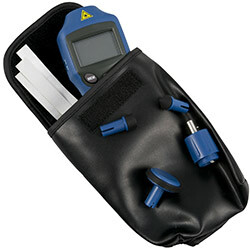 The High Precision Optical Tachometer measuring contact-free. 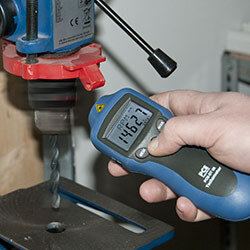 Contact measurement with the High Precision Optical Tachometer. 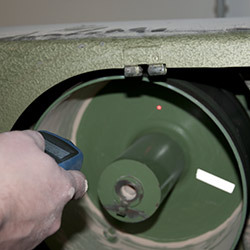 Linear measurement on a conveyor belt with the High Precision Optical Tachometer. The High Precision Optical Tachometer measuring a drilling machine contact-free. ISO calibration certificate For companies that wish to include the device in their group of internal tools or for annual recalibrations. The certification includes a laboratory calibration with test certificate of all measuring values.